For now Europe remains restless—And the tensions between Russia and the 44 million Ukrainians reminds us that Europe can quickly become violent. Russia is a major supplier of natural gas, not only to Ukraine, but also to Europe, with the largest pipeline for that gas running through Ukraine itself. Recent history has shown Russia is willing to use the iron fist of energy to achieve its political aims. Russia’s armed intervention in the Crimea tells us of President Putin’s brutal determination to get his way in Ukraine. The unfolding economic crisis in Europe is a key reasons why Russia feels confident right now. Europeans already pay too much for energy—they do not want their gas bills to go even higher. EU-28 (the 28 countries that make up the member countries in the European Union) do not want to see Russia shut down the pipelines in the Ukraine. 35% to 40% of the total natural-gas imports to the EU comes from Russia, and half of that imported gas flows through Ukraine’s pipelines. Germany is Russia’s largest customer in Europe for natural gas, Europe is just too vulnerable because of its heavy dependence on Russian energy. It is also important that Russia maintains a good relationship with its primary customers — Poland Germany, Italy and the United Kingdom. So Russia will be careful not to offend its top trading partners. The European Union is meeting now to decide on sanctions for Russia. Many leaders have made quite strong statements about this issue. I can only shake my head in wonder. The Germans are calling for refusing to ship bratwurst for one week. France wants to exclude any shipments of Mouton Rothschild for ten days while Greece is considering shutting down the Mykonos hotel discounts for seventy-two hours. Man, these Europeans are tough. Russia’s strategy involves the creation of deep buffers to the West, while it manipulates its neighbors, creating a new regional balance of power in Europe that gives it the buffers it is so determind to have. Russia will not allow the Ukraine to slide over to the European Union (politically). 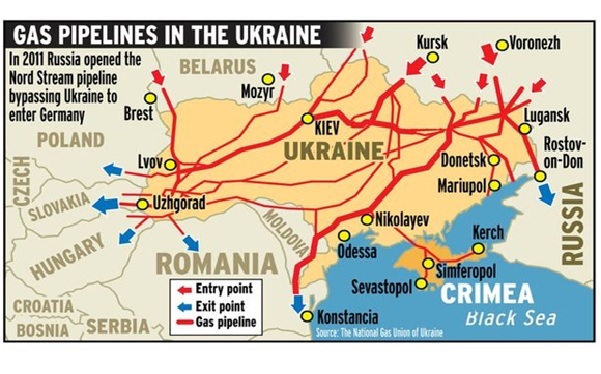 Russia needs the Ukraine as a buffer and agricultural ally, also it is a key nexus for its gas exports. Did you know the Ukraine produces more grain than any other nation with the exception of the United States. Wars and rumors of wars continues (Matthew 24:6)—Nation shall rise against nation—verse 7.